David MacDonald – Page 2 – This Page Left Intentionally Useless. “Yak shaving” is not only fun to say, but it’s a very useful concept. It refers to a series of tiny, seemingly pointless, often mindless tasks that stand between you and accomplishing a larger, more fulfilling project. Sometimes they’re necessary—putting gas in your car before a road trip. Other times they’re procrastinatory1—drawing beautiful album art for the playlist you have lovingly crafted for said road trip. As I try to move much of my work from Sibelius to Dorico, there are many yaks to shave. My practical yak is learning keyboard shortcuts associated with Dorico tools. 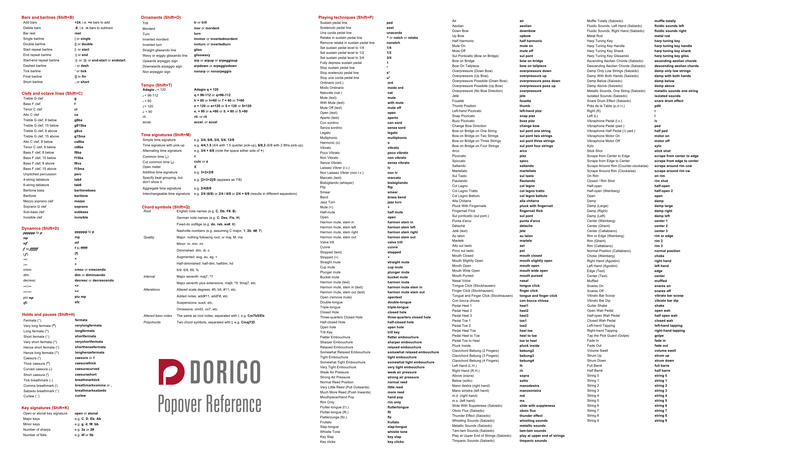 My silly yak is turning the quick reference for Dorico’s popover system into a wallpaper for my 5K iMac so I can easily see all of them. I shaved that yak so you don’t have to. Feel free to download and use. Just a quick warning, the text is already pretty small on my giant screen. It will probably be completely useless on a laptop. Sorry about that. One of the things I love doing over school breaks is catching up on my well-intentioned Instapaper queue. I really like some of Aaron Gervais’s thoughts on audience building in this article I just caught up on from last year. In it, he addresses some of the failed attempts at audience building, and how we can and should be doing it better. He describes some of the trendy classical-music-as-night-club events, and why they might appear to succeed, but fail in the goal of audience development because they are showcasing a type of experience that is in many ways fundamentally different than the thing we’re trying to build the audience for. Once the bouncer explained to [a group of nightclub attendees] what was happening, they left abruptly. People come to nightclubs to dance, so when these clubbers saw that the context of the nightclub was going to be taken over by some kind of classical music thing, their reaction was, “Let’s go somewhere else.” … There were obviously attendees who were there because they were regulars, but more than half the room of what looked like 200-300 people were clearly there either for Mason or one of the ensembles who were playing. … The end result didn’t feel like audiences coming together, it felt more like classical music colonizing another genre’s space. Gervais makes some really interesting points about what communities are, and how we can use our understanding of communities to build one (or several) of our own. Crucially, communities are fundamentally exclusive. That isn’t to say that they’re snobby, just that they don’t include everyone, and that’s ok.
Often in new music we are afraid to ask our audiences to push themselves. That’s a mistake. People like meaningful experiences that they have to work for. The trick is convincing them to expend the effort in the first place. To get there, we start with the advice above: build communities, then guide people into greater depth using MAYA [most advanced yet acceptable] techniques. We have to assume that our audience is there to focus on what we’re presenting with an open and curious mind. If you have any interest in presenting concerts and building an audience for what you do, this is a great read. It’s not a tradition until you do it twice. 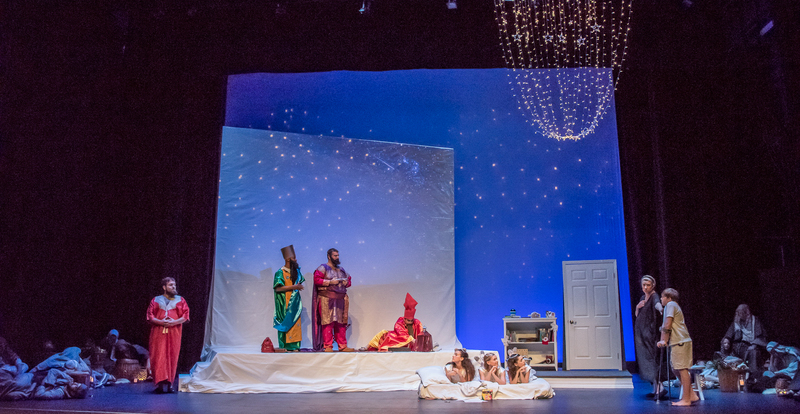 Opera Orlando’s season continued this weekend with their second annual production of Amahl and the Night Visitors, a Christmas-themed opera by Italian-American composer Gian Carlo Menotti. The performance at Dr. Phillips Center’s intimate Pugh Theater establishes what the company hopes will become a new holiday tradition in central Florida. The 1951 opera tells the story of the young boy Amahl, who is disabled and lives in a rich world of his own imagination, fueled by bible stories. Amahl and his mother, herself weary of her son’s exaggerations, are surprised to find that he seems to have imagined into existence the Three Kings of the biblical Christmas story. Opera Orlando’s new 2017 production of Menotti’s Amahl and the Night Visitors. Photo by Brion Price. Though originally set in an earlier time, directors Cara Pfost and Grant Preisser chose to reimagine Amahl and his mother as a small, modern family. The choice to modernize the setting is notable for a production hoping to become a tradition of its own, and I found that it served the performance by making the magi and their coterie seem even more otherworldly by comparison. 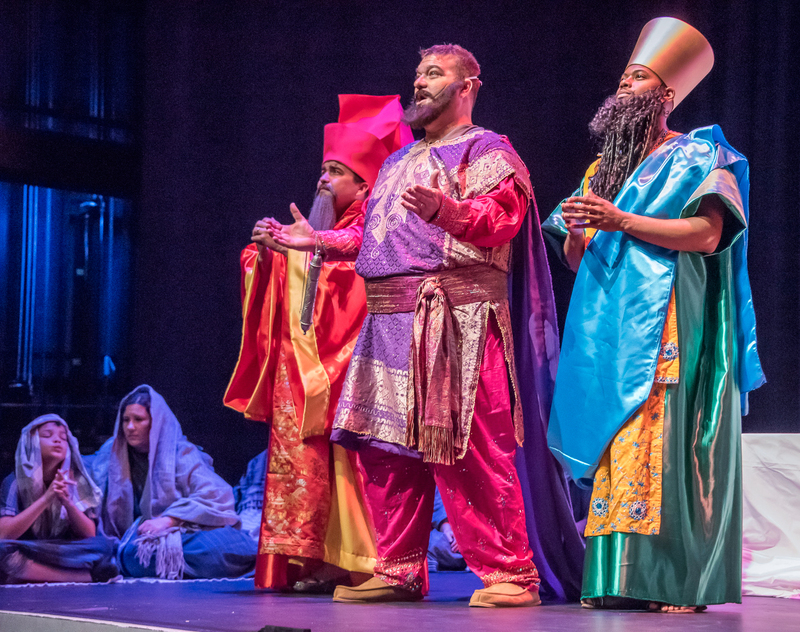 This impression was even further enhanced by a costume design (by Kim Welborn) that separated Amahl’s black-and-white world from the vivid colors of the Kings stepping out of his imagination. My only concern about the setting is that the family is harder to “read” as poor, a fact which is central to the narrative. Another staged change to the story was the addition of a small dance ensemble. Three figures seem to surround and support Amahl’s spirit and imagination. The tasteful choreography emphasized the centrality of Amahl as the entry point into the narrative, and had the added benefit of foreshadowing the shepherds dance in the middle of the opera. Rodrigues, Colsant, and Lovett as the anachronistic magi. Photo by Brion Price. Perhaps one of the most impressive things about Amahl is its local cast. While many productions might fly in flashy out-of-towners, Opera Orlando shows the talented artists here in central Florida. I was particularly impressed by Morgan Davis Peckels as Amahl’s mother. Her voice was full without being aggressive, a delicate balance which was also reflected in her performance of charming warmth and parental authority with Amahl. Another highlight among a stellar cast was eponymous night visitors: the three kings, sung by Peter Rodrigues, Joseph Colsant, and Chevalier Lovett. In some of the more exposed scoring—this performance is accompanied by a small chamber ensemble led by music director Robin Jensen—the three kings’ voices blended beautifully. The ensemble virtuosity of the trio was matched by the three as soloists, as each brought his own amusing levity in solo passages, which highlighted the fantastical absurdity of the narrative. While Menotti’s Amahl may not achieve the Christmas ubiquity of Tchaikovsky’s Nutcracker, it is exactly the same sort of sweet, welcoming repertoire that is perfect for the holiday. And working with less familiar material, creative productions, and world-class artists, Opera Orlando can find a middle ground between nostalgia and novelty that creates a holiday tradition worth returning to each year.